Do you have a large satellite type speaker, which you want to mount on the ceiling? Our Cotytech Speaker Ceiling Mount for Large Satellite Type SP-OS04 might enable you to clear some floor space. Learn about the leader in speaker mounts, speaker brackets and stands: Cotytech. You don't want to take a regular mount and place it on your ceiling. It might not be able to bear the speaker's weight. Purchase a proper weight bearing mount, like the Cotytech Speaker Ceiling Mount Type SP-OS04. This is especially made for heavy speakers weighing 44 lbs (20 kgs). This is ideal for speakers with a thread insert on the back, top or bottom. The mounting surface should be no smaller than 4.33 x 6.89 inches (11 x 17.5 centimeters). Speaker wires of no more than 0.31 inches (8 millimeters) in diameter can be bundled to remove clutter. The extension from the ceiling is 9.45 - 11.42 inches (24 - 29 centimeters). 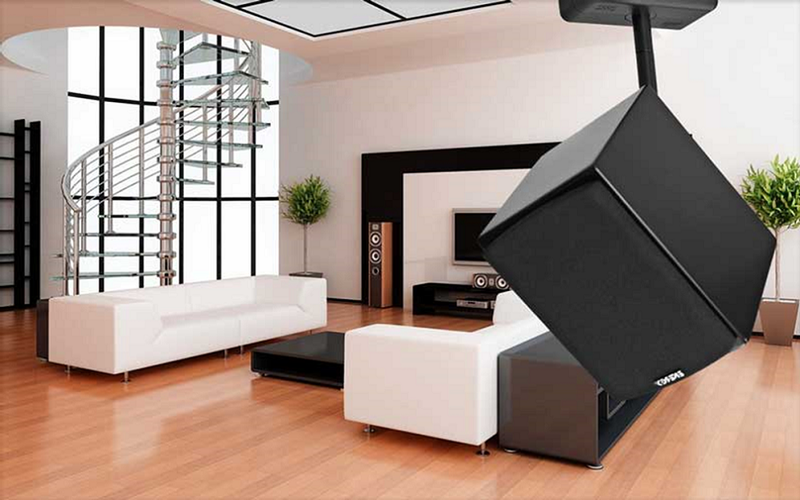 Optimize your limited space with the Cotytech SP-OS04 Speaker Ceiling Mount. You can swivel your speaker from left to right up to 45 degrees. The best surround sound quality has the speakers aimed directly at the listener. Our Cotytech speaker brackets SPOS04 allow you to get the the perfect position to listen to your favorite music. They have 360 degree rotation for optimal positioning. We stand 100% behind all of our products. When you purchase our Speaker Ceiling Mounts for Large Satellite Type SP-OS04, they will be delivered in pairs. Create the best acoustical arrangements for your outstanding home theatre. We also offer hands-free iPad mounts. With the iPad headrest mount, you can put your electronic device on the back of your car, truck or SUV. This allows you to keep your children busy during trips. We, at Cotytech, offer a wide range of speaker brackets and stands. You can find the right tablet mounts to ensure that your electronic devices are always within close reach. Cotytech speaker mounts adhere to the most demanding ergonomic principles, allowing you to comfortably enjoy all of your audio. We have more than 3 decades of experience in the flat screen and monitor mount industry. We listen closely to our clients and create the best mounts for their purposes. Our speaker mounts have superior consumer-defined qualities, state-of-the-art features, and aesthetic appeal.